Even though the longest day of the year happened on Sunday, it’s been feeling like summer for a long time here in Vancouver. The most gorgeous spring has turned into summer, where long hot sunny days seem to be the norm. No June gloom in sight, phew! I made this pie because we were having some friends over for dinner and I wanted a nice summery finish to our meal. With it’s pale creamy hue and bright flavour, this lemon pie is a lovely refresher for hot summer days. 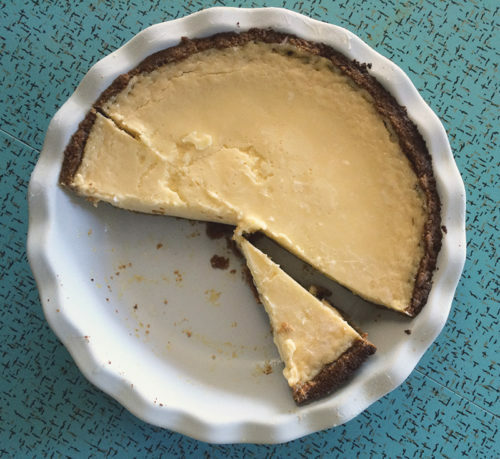 There’s a cup and a half of lemon juice in the filling and I was nervous about this pie being too lemony, but I would rather have the pie be too tart than too sweet. 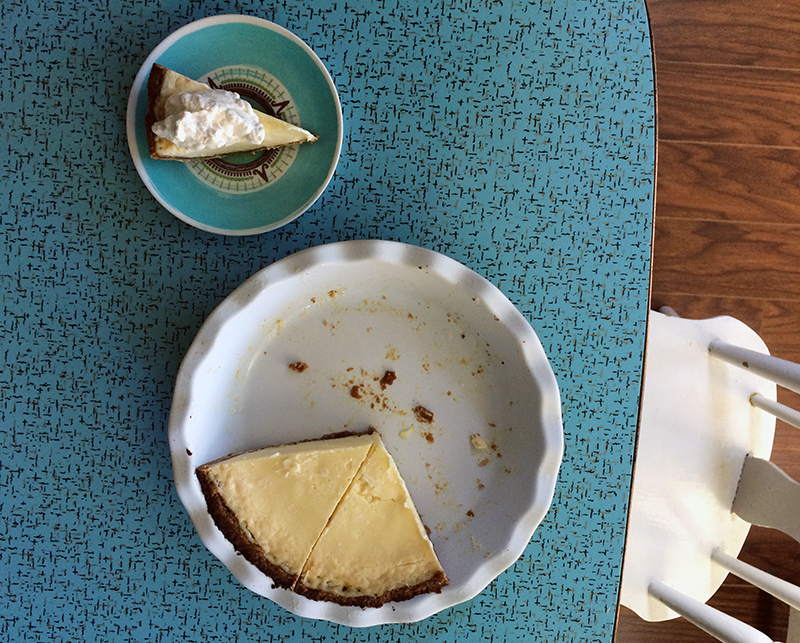 But it all turned out okay….the pie is very lemony, but everyone loved it. 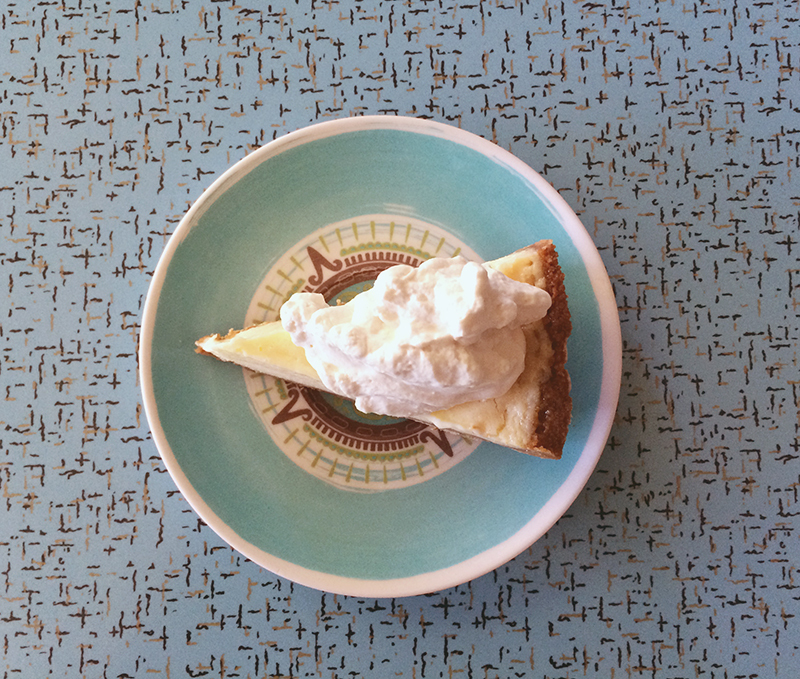 It helps that a nice flop of sweetened vanilla whipping cream is served alongside every slice. The following day, I invited a friend over and she generously exclaimed that this was the best pie she had ever eaten. So no need to be nervous about the sheer amount of lemon power involved. Though, if you have timid tastebuds, I do suggest using only 1 cup of fresh lemon juice. You can always taste the uncooked custard and adjust the flavour as desired. 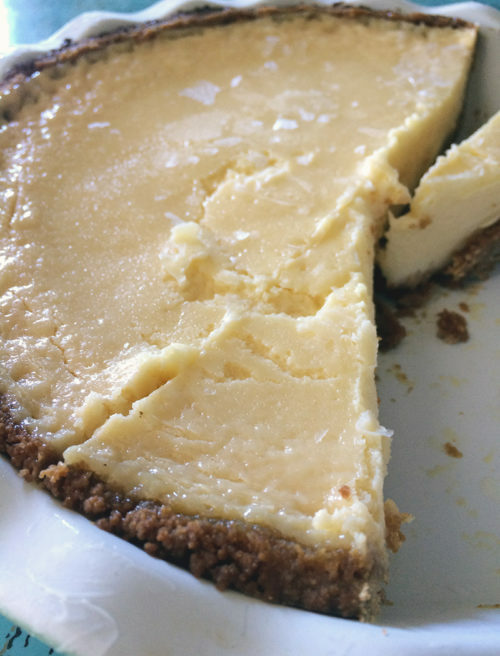 While the custard is a knock-out and very easy to make (it uses cans of sweetened condensed milk and 2 yolks instead of a terrifying 12 yolks I saw in some custard recipes), the crust is no slouch either. Instead of the more traditional graham cracker crust, I decided to play with gingersnap cookies as a base. I used a very crunchy gingersnap cookie (McVities Ginger Nuts) and ground them up finely in my food processor. To up the ginger ante, I added a spoonful of powdered ginger. If you wanted to go whole hog, I would imagine a grating of french ginger wouldn’t be out of place either. The crust was great and the ginger flavour paired deliciously well with the tart lemon filling. I was worried that the pie after sitting in the freezer for nearly 24 hours would be frozen solid, but the texture was perfect. Not quite dissimilar to ice cream, the texture was cold and creamy and refreshing. It was difficult to slice through the crust though, but a steady hand, a heavy sharp knife and good pressure made short work of it. Use your food processor to crush your gingersnaps (or a ziplock and a rolling pin to whack away your biscuits into crumbs). Once you’ve measured your ginger snap cookie crumbs after crushing them, add them back into your food processor (or use a bowl and mix with a fork) along with the sugar, powdered ginger and melted butter. Pulse a few times to combine. Press into a 9″ pie plate, making sure to get even coverage along both the sides and the bottom. Bake in oven for 10 minutes. 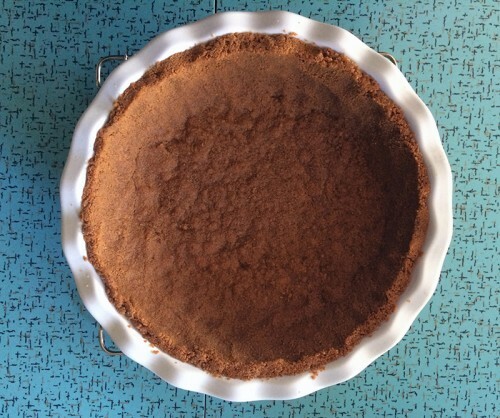 Let crust cool completely. This step can be done up to 2 days before. In a large mixing bowl in your stand mixer (or use an electric hand mixer), mix the lemon juice with the yolks and sweetened condensed milk over medium-high speed for 5 minutes. Pour into prepared crust and bake for 20 minutes until the filling has slightly set – there will be a wobble. About 1/3 cup of the filling didn’t fit into my crust, so I poured it into a ramekin and baked that too for an extra little treat. Remove pie from oven and let cool completely. Cover the pie with plastic wrap, being careful to not let the plastic touch the top of the custard. Freeze for 2 hours or overnight. Beat the whipping cream until nearly thick, adding in the sugar and vanilla and beating further until it reaches a desired (ie. thick & luscious) consistency). 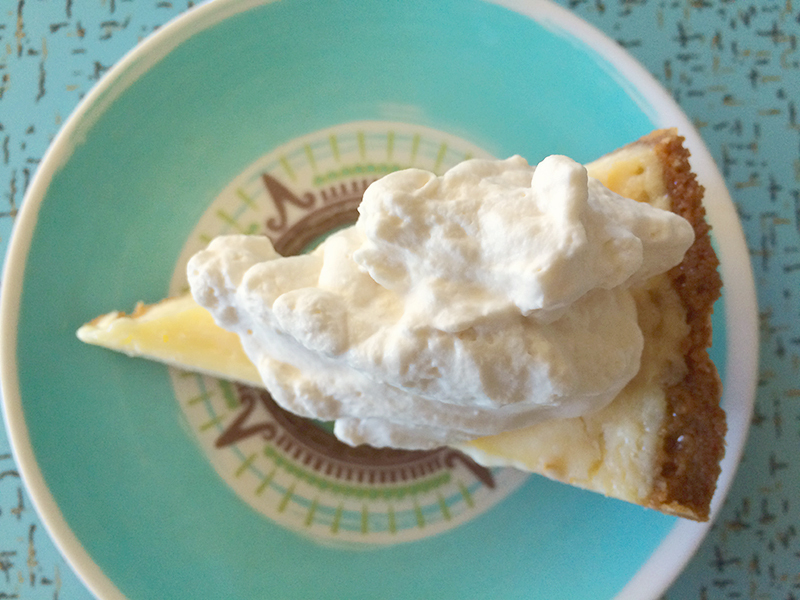 Remove pie from the freezer and spread whipped cream over pie before serving – no need to thaw the pie. Or you can add fluffy dollops of cream over each slice like I did. Serve in small slices. This pie sounds so delicious! I definitely appreciate avoiding the need for an entire dozen eggs, too. That is a LOT. We’ve just had our shortest day here in New Zealand -it’s so cold dark! Your pie looks delish. It will be a great way to use the lemons on my tree! Lucy, I want summer to come quickly for you! Enjoy your lemons. Looks and sounds so delicious!! Ginger + lemon = YUM! What a lovely flavor combo! Perfect for a hot afternoon (like this afternoon). 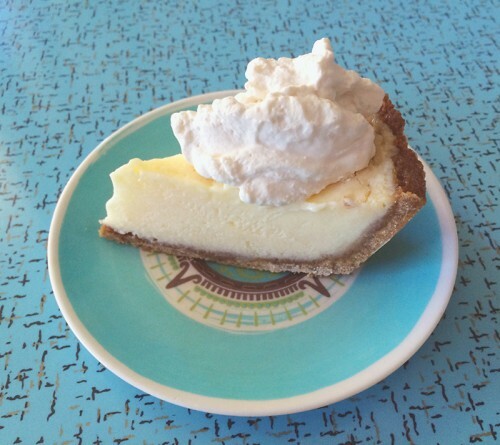 Oh yes, RMW, it’s the perfect dessert for hot days! Yum! Sounds just like the recipe on TV last night by Cat Cora. Great pie. All was perfect except t do think the crust needed to be thinner to cut through in frozen state with fork at the table.. maybe cut back to one and half cups. I made it in a 9″ springform pan so cutting into pieces was simple.